Cameron McGeehan Picture Tony Johnson. Barnsley are sweating over the fitness of a couple of unnamed players ahead of Friday’s South Yorkshire derby against Doncaster. 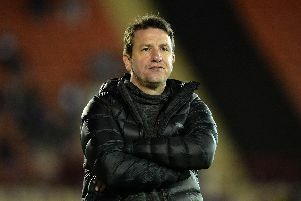 Reds head coach Daniel Stendel’s options are already limited due to 18-goal top-scorer Kieffer Moore’s season-ending injury plus the suspensions of midfielder Cameron McGeehan and winger Jacob Brown. And Stendel will have to assess his squad for the trip to the Keepmoat Stadium following Tuesday’s gruelling goalless draw with fellow automatic-promotion chasers Sunderland. Assistant head coach Dale Tonge said: “We have a few concerns after Tuesday night, so it is a case of monitoring the boys today, wrapping a few up in cotton wool and hoping they will be alright for Friday. “Three or four from Tuesday night, a couple serious for tomorrow night and a couple that we think will be fine. “The beginning of the week it (making changes) was something we thought about, but as games pan out it is nice to have a bit of hindsight. “Can you play this, that or the other? Tonge is adamant Barnsley’s squad has enough strength in depth to cope with several absentees. “I think it is something we have been questioned a lot on,” he said. “When you are winning games then the team invariably doesn’t change. Second-placed Barnsley’s 17-game unbeaten run comes under threat by a Doncaster side who are occupying the final play-off spot. Rovers have not won in five matches, but Barnsley-born Tonge knows form goes out of the window in a local derby. “I don’t think I ever beat Doncaster as a player. I hated playing Doncaster,” he said. “One of those clubs, not a bogey team but of that sort. It’s always a good local derby, always a good following from Doncaster, and we are looking forward to it. “It is a big rivalry. We are not looking at past results, we are expecting a strong Doncaster. These are the worst crime hotspots in Sheffield so far in 2019 – how does your area compare?